Shrek has captured hearts and minds as a film globally for the best part of two decades, so when DreamWorks announced a musical adaption, it didn’t come as a surprise. However, what Shrek The Musical does, which is unusual, is to take that which is loved about the film and give it a completely new life. With music by Tony Award winning composer Jeanine Tesori and book & lyrics by David Lindsay-Abaire – it’s well crafted, as tongue in cheek as the movie, and caters for a broad spectrum of audiences. 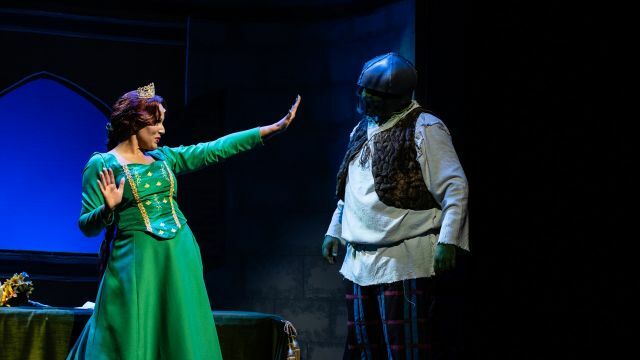 From the first rousing note by Lindsay Kaul’s stunningly tight orchestra, to the final energy-packed number I’m A Believer, it’s clear that after all these years, Shrek still has the big heart and a big message of acceptance and diversity. It’s probably far more relevant in today than when the movie first came out in 2001. Director Darryl Davis, and his team have at most points stayed true to the Broadway production’s style, while still giving the show their own flair. Since it’s Broadway production (which was filmed and released some years later) the show has undergone some noticeable changes. Some work very well; most notablyDragon’s new song, Forever. Yet, sadly, some newer aspects appear clunky and jarring; aspects of which are beyond the control of this production. There is something to be said for scaling down a multimillion dollar Broadway production to fit into the more modest resources of the community arena. Joseph Issa brings Shrek to life with the amount of emotion and gravitas you’d expect from a leading man. Jade Draper embodies Fiona in the usual way she tackles any role, bringing class and passion to her performances (even during slight wardrobe malfunctions). Adam Young brilliantly traverses the line between paying homage to Eddie Murphy’s Donkey while making it his own. Bee Haslam plays Dragon with incredible soul and power. Xander Cross, and Jissel Toomey, both shine as Pinocchio and Gingy respectively. The Ensemble are strong in all the right ways, and dressed in a vivid array of costumes by Rhonda Griffiths. 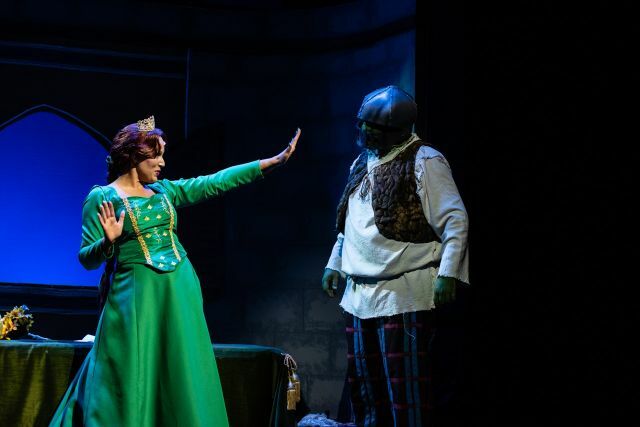 But above (yet below) all others, it’s Finn Gough’s portrayal of Lord Farquaad who completely steals the show in the short amount of time the character spends on stage. The program states he’s completing year 12 this year. There is no doubt in a few years he’ll be running rings around professional performers.